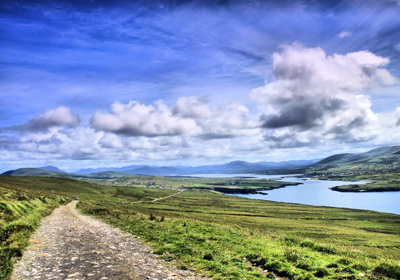 Prepare to be awed by the dramatic scenery of County Kerry. From sprawling green fields to jagged coastline, to mountains and lakes and farmland. Near one of Ireland's best national parks, on the edge of the legendary Ring of Kerry, and with good access to three of the region's most beautiful peninsulas, the Ireland Untour puts the best of the southwest within reach. Stay in a charming cottage either in the Irish countryside or in the colorful village of Kenmare. Inquire about the possibility of seeing the region without a rental car. Day trip options: The Ring of Kerry, Dingle, Killarney National Park, Cork, Blarney Castle, Kinsale, Skellig Islands, Inch Beach, the Beara Peninsula and much more! You can also choose your party size and date at left date for pricing and availability. Sightseeing:The Ring of Kerry offers wild beauty with its endless vistas of mountain, lakes, and sea. Explore the ring road and its many offshoots or take a sunset cruise on Kenmare Bay. Or head north to charming Dingle and discover the gardens and lakes of the Dingle Peninsula, where you can find all manner of water activities. Hiking, golf, and horseback riding are easy to enjoy here. Historic Kinsale is one of many options to visit in West Cork. Additionally the waterfalls, gardens and historic houses of Killarney National Park are yours to discover. Off-the-beaten-track attractions that can’t be beat: Enjoy dramatic coastal views without the tour buses in the beautiful wilderness of the Beara Peninsula, where you can buy today's catch straight from the fishermen. Follow narrow rural lanes to pre-historic stone circles and imposing ring forts near the coast. Explore the Skellig Ring, with it's picturesque ruins, local arts, and history. Hike the local mountain on well marked paths, or explore the Kerry Craft Trail and meet local potters, wood carvers, and painters in their studios. Discover hidden beaches in the wild coastline of the Dingle Peninsula, or sample a local microbrew. One or two weeks in a personally selected apartment in the stunning Irish countryside or quaint village of Kenmare. Transfer assistance for airport arrivals into Cork and a GPS that allows you to reach your apartment with ease. Detailed arrival and driving instructions for arrivals at Shannon Airport. A Michelin map of Ireland, our own guide book for the area, and further information on-site. A local cultural event, like a traditional Irish meal.